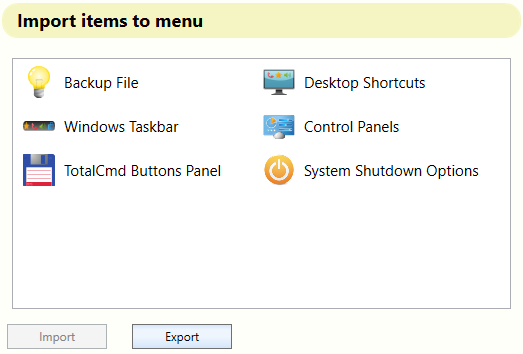 Imagine menu where you have all installed applications, control panels and favourite folders in one list that is accesible on one click and displayed at your mouse cursor, with touch control support. All applications sort by columns and highlited or hidden as you need, to get easy way how to show only the needed items. This list you create easily by Import form or dragging to list. This START menu is not only for launching application, but also you can set start as admin, autostart with Windows, assign a Hotkey, run more application at once, uninstall application or find application that was moved to another location. Install software STARTzjs menu and gain two more applications. In Alarmclock you can set up at certain time or when there is a file change in the folder or title app window change, then will be executed an action like show message, play sound or turn off pc or start/shutdown application(s). The third one is Calculator where you can write or paste example and that has big memory. Running application has bulb icon in the taskbar. 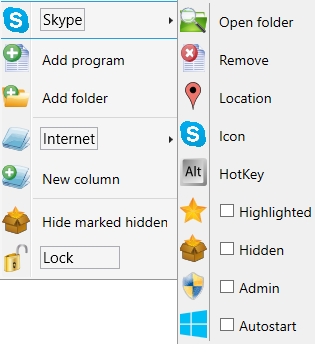 From Windows 8 you can pin the icon where Windows used to have Start menu or from Windows 10 next to Start menu. You can open STARTzjs menu by clicking on bulb or by HotKey. When you have better mouse with more buttons, you can assing HotKey to mouse button and have menu in one click. 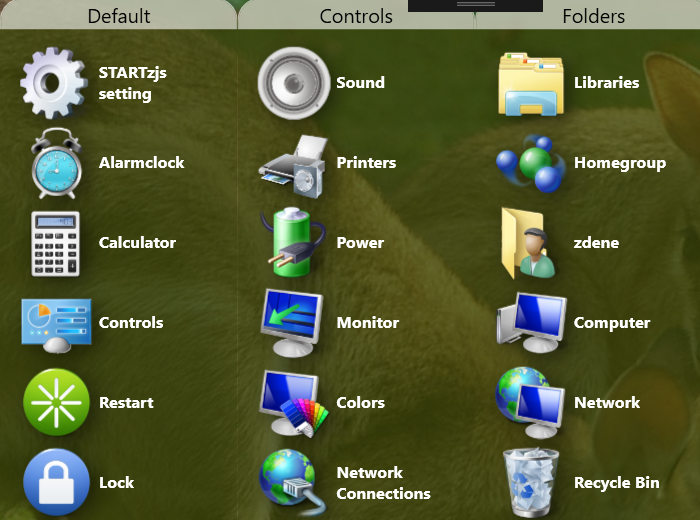 The main system monitor must be at the top left for proper operation on multiple monitors. This is how STARTzjs menu looks like, how organised you can sort your applications and folders, just by drag and drop. For a description of the controls, see the Info in the setting. Left click on menu item you launch the application. Left click and drag on menu item moves it to another position. You can switch columns by left click on column header and drag to another. Left click on menu where is no header or item, you can move whole menu cross the screen. Left double-click on menu you can hide the menu. Rigth click on menu item or column header opens context menu. Menu item can be highlighted, hidden, changed its icon or assigned a HotKey. For file item you can set start as admin or autostart with Windows or uninstall installed application. 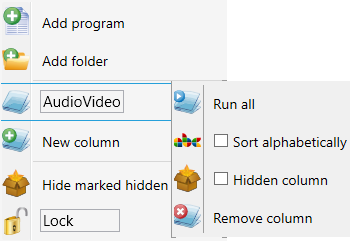 Rigth click on menu column opens context menu, where you can rename column, hide it or sort menu items alphabetically. In the end of item context menu is option Hide hidden that hides all menu items and columns set as hidden. If STARTzjs menu can not access any missing file (could be moved), you can choose to Search missing files in your drive automatically. Setting of STARTzjs menu is accesible as menu item in column Default. In setting Import you may add easily common folders, control panels or system shutdown options. 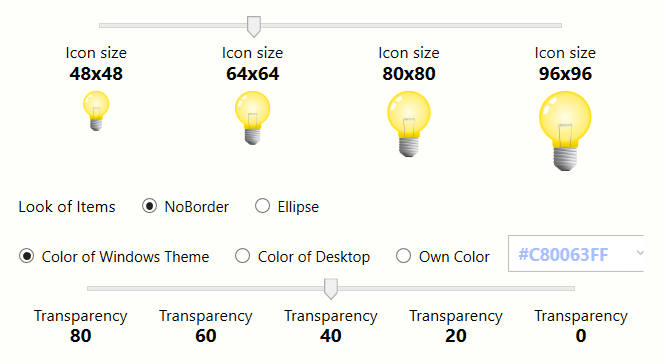 In setting View you can change menu color, transparency, item style and size. On left side of tabcontrol is a list of events that the Alarmclock can respond to. On right side of tabcontrol is a list of actions that Alarmclock is able to execute. Below is a list of added alarms that are saved and ready with the settings. Unless you start clock, alarms are not active. When alarm is executed, is deleted, unless you have chosen to repeat him. If clock was running and system was restarted, the alarms are loaded and clock continues. You can use alarm for many purposes. For example after downloading file, the computer can be turn off. Or at certain time launch application(s) or show warning message. 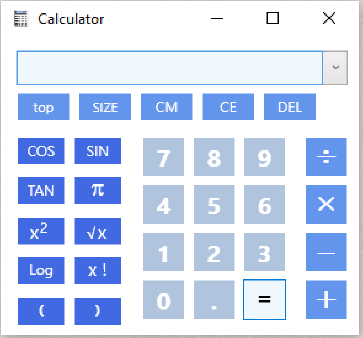 You can write or paste example to calculator directy and every example(result) is remembered.